In modern hotel and tourism business conference becomes a part and parcel. Many people go for attending meetings and conferences every single day. 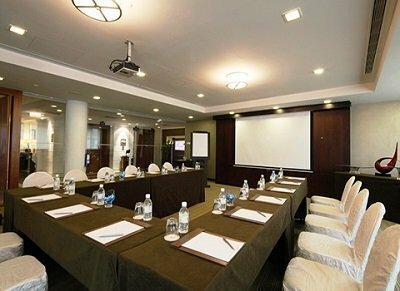 Because of great demand of having good conferencing facilities in hotels and resorts, it is natural to keep most modern conferencing facilities within the premises of standard hotels. Now carefully observe following 2 conversations between hotel staff and event organizer. We tried to make the conversation as detail and as realistic as possible. By reading this dialogue, you should get better understanding on how to handle event organizer and how to set up a perfect environment to arrange a meeting or conference. To read more hotel and restaurant related English dialogues or conversations click HERE. Dr. Patric: So the conference will be from 1st November to 7th. This time participants will be around 300. How many people can you accommodate duing those days? Hotel Staff: Ok Mr. Patric. The dates you mentioned will be perfectly all right. We have another conference finishing on 29th October and there will be another meetion on 10th November. So yes we can fit you very well. Regarding the facilities, well, perhaps I can give you a brief idea of what we can offer. Dr. Patric: Oh yes. That will be great then. Hotel Staff: Ok, Mr. Patric, basically our centre is a multi-purpose conference center with 400 seating capacity in theatre style and 360 in round table for the delegates in the main auditorium. Besides there are two smaller conference rooms each having the seating capacity of 60 persons. Dr. Patric: That’s good. Can we hold all our delegates together, if we had a full session of the conference? Hotel Staff: Certainly. And the smaller rooms you can use for group disussions or even lectures. Hotel Staff: Our sound proof removable partition between the two can also be opened if necessary for a bigger space. Dr. Patric: That could be an useful feature. What about the technical facilities? I mean audio-visual and other electronic facilities? Hotel Staff: We have build-in-audio-visual equipment. We found this performs superb. Dr. Patric: Do you have interpreter facilities? We might have participants from good number of non english spoken countries. Hotel Staff: Yes, indeed. Our main audiotorium has full simultaneous translation equipment with all major language options. You will see both the auditorims and other 2 rooms have excellent acoustics. Dr. Patric: I think that will serve our purpose. Hotel Staff: There is an exhibition hall for display purposes. You may plan to exhibit brochures, posters and equipment and we have around 50 square feet space for that. Dr. Patric: That’s brililant. We might need some display space. By the way, do you have any printed matter, I mean, brochure or leaflet on these facilities? I would love to study all the details. Hotel Staff: Certainly. I will send you all the brochures and leaflet with a complete description and the actual plan of the conference centre. I think you will find these very resourceful. Dr. Patric: I hope so. After going through all, I will call you cak. Ok? Hotel Staff: All right sir. Have a great day. Dr. Patric: ll right, if I just run through the equipment with you, I see, you have already the OHP and the screen in position. How about the markers and pointer? Hotel Staff: We provide the markers just before starting with the laser pointer. What colors of markers do you prefer? Dr. Patric: Provide all possible colors, perhaps our speakers will need them in varities. Hotel Staff: Certainly. I will order for a complete range and you will get them by this afternoon. Dr. Patric: The slide projector does not seem to be working. Could you ask somebody to check? Hotel Staff: Sure. I think the bulb needs to be changed and the technicans are going to replace that soon. Dr. Patric: What about the film projector, it also seems not to be working. Hotel Staff: Lets see,…No it’s OK. It wasn’t plugged in properly. You see…, now it might need a new empty reel. Dr. Patric: Yes, you can provide one more empty reel. I think most of the equipment are OK, but you can have a final look by this evening so that we can start everything nicely next morning. Hotel Staff: Yes, of course. We must check everything before you start, it’s our responsibility and we assure you everything will be perfectly all right. Dr. Patric: That’s great. So, what about the stationery and other supplies? Hotel Staff: Well, my secretary will be ready with all stationery and supplies and she will hand over to your manager (logistic) by this evening with a complete list. Moreover, she will remain stand by from tomorrow for any sorts of assistance. Furthermore, our one technician will always be ready for your assistance regarding any technical difficulties. Hotel Staff: It’s always ready in the head table. Dr. Patric: Last but not least, can we check the PA system? There is nothing more annoying than finding the amplifier isn’t adjusted properly or the microphone isn’t connected. Hotel Staff: Or if you get a horrible whine coming through the loudspeaker? Yes you are very much right Mr. Patric. We would rather test it. Hope everything is fine as we didn’t face such problem with our PA system till to date. Dr. Patric: Good. It seems perfectly alright. So, anyway, let’s hope for the best and make the rest of the arrangements discussion with our manager- logistic. I will see you then in the morning. Take care. Hotel Staff: Don’t worry at all sir. We always care to provide best service according to our goodwill. See you tomorrow in the morning, sir. Good bye.